Here you will find RCUB Results 2019, Rani Channamma University Exam Result 2019, RCUB Semester Exam Marksheet 2019 for all courses offered by the university. Well, you might probably be looking for the RCUB Results 2019, aren’t you? We have heard that there is a great enthusiasm in all of you towards knowing the status of the result of your programmes. To all aspirants who are pursuing their UG & PG courses from this Rani Channamma University, Belgaum. Every year, half a year, lots of UG/PG courses’ exams are conducted by the university to deliver better education to the enrolled students out there. Lots of applicants are undergoing their courses based on their interested in the specific field they’ve chosen. Just like any other institution/ university, mark sheets are usually out on the main website i.e. www.rcub.ac.in. For those who get their education Semester Wise check their scorecards as per their current semester like 1st Sem, 2nd Sem, 3rd Sem, 4th Sem, 5th Sem, 6th Sem, etc. And, rest of the people get to know the status annually. Well-known courses like B.A, B.Sc, B.C.A, B.Com, B.Ed, B.B.A, M.Sc, M.A, M.Com, and a lot of other professional courses are offered by this university and with great interest, students participate in them. 12.04.2018: रानी चन्नामा विश्वविद्यालय ने 29 नवम्बर को बहुत सारे कोर्स के परिणाम जारी किये हैं जैसे कि नीचे दी गयी टेबल के माध्यम से बताये गए हैं: अगर आप रानी चन्नामा विश्वविद्यालय से जुडी अन्य जानकारी प्राप्त करना चाहते हैं तो हमारी वेबसाइट (सरकारी लैटर) को अभी सब्सक्राइब करें. Latest Updates on 09-07-2017: The University has updated its result section with the marksheet of various courses. Please take your valuable time for checking out the scorecard all the way through the link accessible at the bottom side of this page. Latest Updates on 25-06-2017: We've come to know Rani Channamma University has declared results of various semester exams for the courses, namely BCA, MBA, MCA, BA, B.Sc., M.Com, MA, M.P.Ed. B.P.Ed., etc. To find out more, make sure you go through the links below. Recent News as on 20-06-2017: According to the latest news, RCUB has issued the results of B.Sc. (VI Semester) for BSC2 and BSC3 Degree on 20th June 2017 and result of BBA (VI Semester) was declared on 19th June for the degree BBA2. Please check out the link at the bottom to see your results. Rani Channamma University is situated in Belgaum (Belagam) and the year it was founded in is 2010. The chancellor of University is Vajubhai Vala. A variety of courses is offered in RCUB to provide the students with a better future. This is done with an objective to shape their future with an intention to give the student the confidence so that they can stand anywhere with full proud. The list of the courses that many students enrolled them in are BA, BBA, MA, MBA, B.Sc, M.Sc, B.Com, M.Com, BP.Ed, BCA, MCA, MAHIN, etc. Besides these programmes, there are lots of others (You may check complete courses offered by the university). In order to download RCUB Belgaum Results, the contenders would necessarily be asked their “Roll Number” along with the “Semester (I, II, III, IV, V, VI, etc.)”. If they are not studying semester wise, they have to select the current year of the exam (i.e. downloading results annually/yearly/year wise). Wondering we have mentioned the name of various courses in the above-given heading? Well, these are the major courses that attentive people enrol for while doing their preparation. You would get the link to directly access the “Login Page” of the results so that you don’t have to wander here and there in search of your most sought results. So, no matter whether you are in 1st Sem, 2nd Sem, 3rd Sem, 4th Sem, 5h Sem, 6th Sem, etc. Along with knowing the status, you would also be able to download the PDF of RCUB Result 2017 easily. But, you have to ascertain what while checking the results. Make sure to enter the right data as per the recommendation. If you want to seek UG/PG results, you have to check out the official link as given in the following section. Also, if contenders want to keep themselves updated when it comes to the scorecards, we want them to subscribe to this blog using their E-Mail Id. The University’s official portal must be visited by all applicants in order to have the correct information. We, therefore, have given a link underneath which lets you visit there. Further details given will be provided as soon as available. Till then, you need to pay attention to the links furnished at the bottom. We know that you want your success. But, it is not an easy thing to obtain. You have to struggle for it and put all efforts in it. If you have applied for UG (Under Graduate) or PG (Post Graduate), you should know what your performance says about the status of the result. And, this can only be done if you hang on to this page. Yes, you heard it right. Whichever update you are seeking about Rani Channamma University Results 2017, just let our team of jobsdeal.in know about it and the rest of the work will be taken care of by the team. Just make sure to be polite while commenting on our blog and try not to spam because every comment see here is moderated before they are published by the members. If you think we have missed something valuable from adding to this article, you can tell us what it is by dropping your valuable comments and give us your feedback about the same. Firstly, visit the authorised web portal of the university. Then, you have to go to the “Result” section and click on the appropriate link. Provide your “Roll No.” and “Semester” and click on “Submit” button. After a while, your results will appear on the screen. Click on the link to get your marksheets. 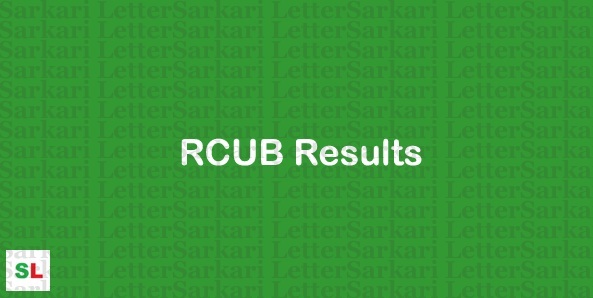 If you want to receive more updates on RCUB Results 2019, keep an eye on this page. Till then, check out the following link to get to the result section of the university.